My holiday week for this summer was a trip to Greece, to meet an old net pal Constantis we visited three years ago the last time. Essentially for me the trip was nine days of total relaxation surrounded with friends, food, diving and geeky entertainment. 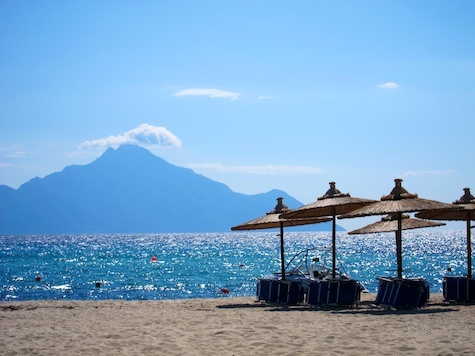 Platanitsi beach, with mount Athos on the background. There is actually not that much to tell about the trip, which doesn’t mean that it was a boring one in any sense – it’s just that for once I did on holiday what normal people apparently do, which is to idle, feed and just damn relax. From Thessaloniki we went to Constantis’ family’s cabin in the Halkidiki region, where we spent the lion’s share of the time. 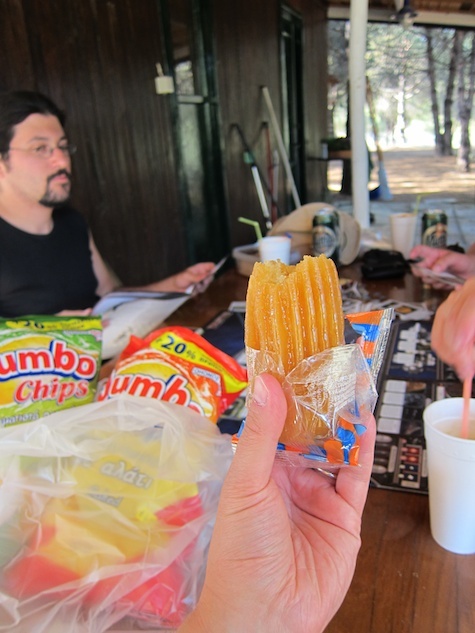 Mostly our days consisted of getting up at around or just before noon, drinking the morning frappé, doing a bit of board gaming, then going to the beach or to dive, eating until we cried tears of sweet pain and joy, and finishing the evening with some more board games. In the beginning we had a couple of Constantis’ pals with us, Lefteris and Xenophon, and we had one proper party night, when tsipouro was drank until the sun came up. 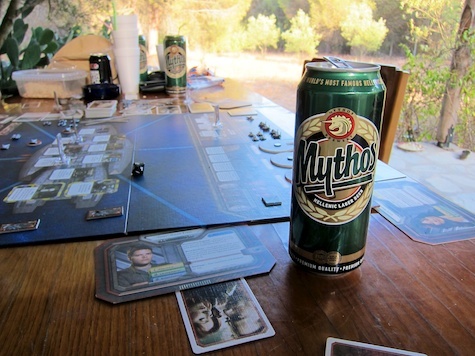 Mythos beer – the official beer for playing Arkham Horror (here substituted with Galactica). I made it to the beach only twice, because of a massive brainfart. Being a pasty white Finn, I lathered my shoulders with sunscreen pretty thoroughly, totally neglecting my lower back – and on the second trip proceeded to go out snorkeling for a hour and a half straight, with my back towards the skies. Needless to say, the sunburn was bad enough to keep me in the hammock reading Embassytown when the others went to swim after that. 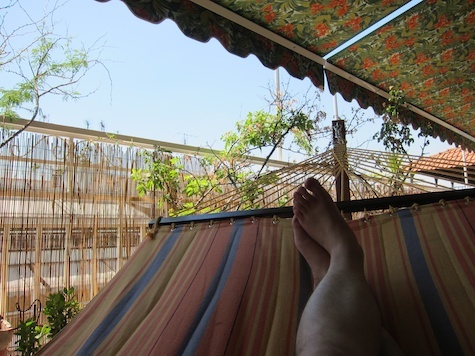 I didn’t mind really – reading a good book, drinking cold soda and listening to the deafening sound of the crickets and cicadas was just what I needed. We managed to get some diving done, and for me and Susi it was very interesting, because three years ago, when we had just gotten our Open Water Diver licenses, we did our first dives in the same dive center we went to this time: AquaLand. Coincidentally, Riikka was now in the same situation as we had been, doing her first dive ever outside of the basic level course. Jori and Susi, on the boat to the dive location. We had long interesting chats with the guy running the dive center, Angelos, ranging from professional underwater work to Greek politics and why it’s going to hell right now. 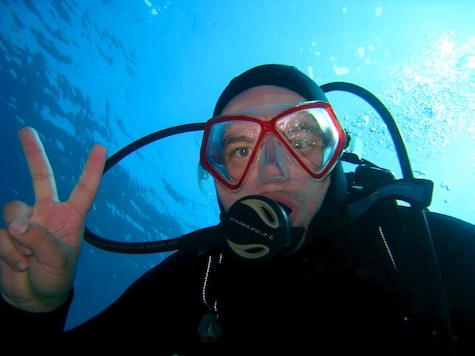 I also got to practice my Hungarian a bit, since the dive center had two Hungarian divemasters, Miki and Judit. I noticed the nationality of Miki by his shirt, which had the logo of Debrecen diving club. The concept felt pretty weird to me, since the two times I’ve been to Debrecen, which is middle of the damn pusta, we didn’t find enough open water to swim in. These “lost hearts” look downright freaky. 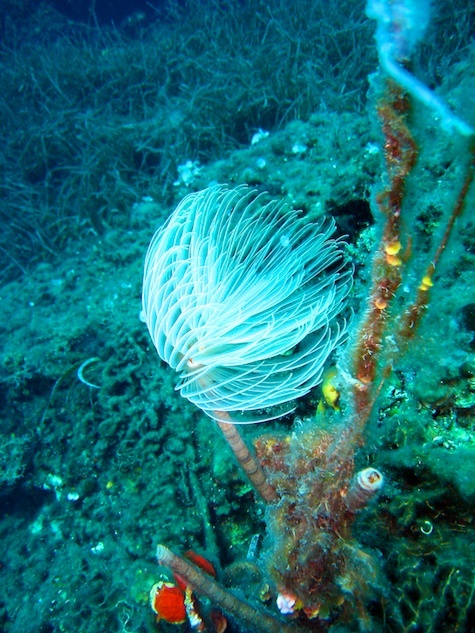 The dives were pleasant, and there was a surprising amount of marine life to see. 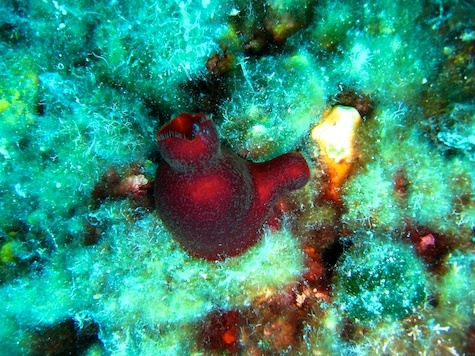 According to Angelos something weird had happened in one location, though, since the moray eels were out of their holes in a way that you almost never see them, and many of the squid holes were empty. Nevertheless, I was happy to see all the squids and morays and other things, and the vast expanses of seaweed that feel like you are flying over a grassy plain. 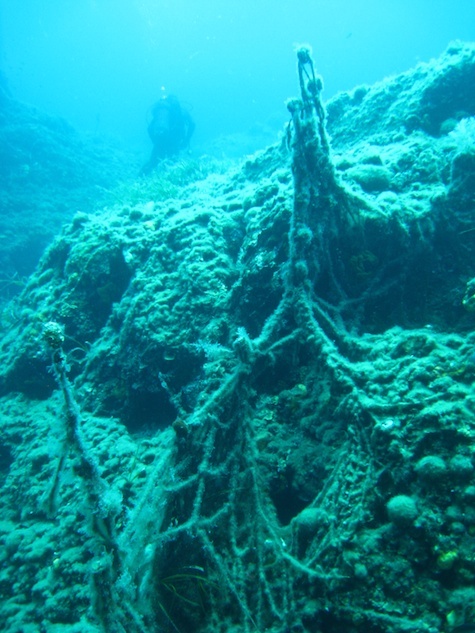 Also I don’t remember seeing or experiencing a thermocline quite like we had in those dives – the mixing of colder and warmer water making everything look like someone used a swirling crystallization filter on the world. The drop in temperature was from about +24C to +15C. Jori going all anime underwater. An old fishing net, with the floats still trying their best to lift it up to the surface. We got back to Thessaloniki for one night of drunken debauchery, which also involved eating a lot, just like most kinds of a social events seems to do in Greece. 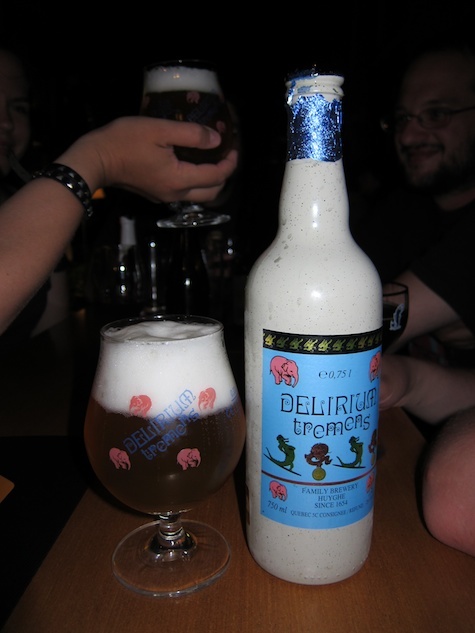 We started the evening in Beer Store, that was essentially a…well, beer store that was also a bar, with a pretty impressive selection of beers around the world. From there we continued to a club to listen to music called rempetiko, which is basically a kind of stoner folk with a kind of a country music mentality in the lyrics. All in all, a perfect night to end a good trip. 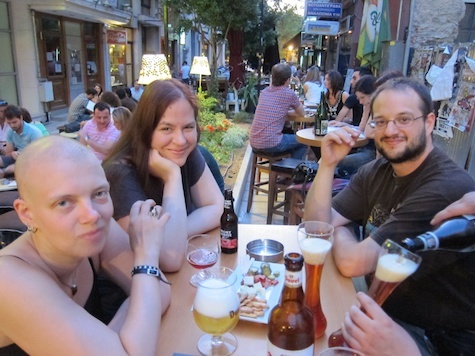 Susi, Riikka and Vasilis – getting our beer on. What it says on the bottle. The trip introduced us to a bunch of new interesting board games – partly thanks to Constantis having a brain fart and forgetting the monster counters of Arkham Horror at home. We ended up playing Cosmic Encounter, Galactica and Last Night on Earth, the first of which is a purely competitive game, the others kind of semi-competitive, but mostly about co-operation. Cosmic Encounter is a very elegant game about space conquest – fast paced and fun, the rules are easy to learn and one game takes about a couple of hours. Especially the over the top special powers of different races are amusing and a really fun game element. Last Night on Earth is a co-operative game that’s basically about recreating bad B-class zombie movies. There are several scenarios to play, ranging from defending a mansion to just killing a bunch of undead. One of the players plays the zombies and the others play hilarious trope characters from zombie flicks. The game is pretty fast paced and very fun to play, the only bad things being the slightly sucky rulebook and some small balance issues *cough*fence post*cough*. 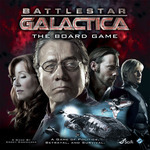 Battlestar Galactica – now, this is a gem. I’ve heard a lot of this game I’ve never had the chance to try it before. Battlestar Galactica takes place in the very beginning of the story of the TV series, when the humans are still running away in panic, there’s a crisis after a crisis and the “who’s a human, who’s a cylon” paranoia runs rampant. The game is kind of co-operative, except of course for the cylon players, who are chosen randomly and in secret. So, in the beginning there can be one, two or no cylons at all, and in the end there is one or two cylon players – you never know. The great thing is that the player can find out that he or she is a cylon in the middle of the game in addition to the beginning. The mechanics for a skills check required to do stuff in the game makes it sure that the cylons can sabotage the human players in secret, but it’s usually clear for everybody when someone is screwing with them. The paranoia runs deep and delicious, and quite often it’s an innocent human who gets sent into the brig, because of disgraceful character assassination towards poor Dr. Balthar, who had only the well being of the fleet on his mind! I’ve had the bad habit of trying to make every second of my life productive, and I’ve been actively getting rid of that in the last couple of years. This trip to see Constantis and to geek around was pretty damn perfect for exactly that purpose. Greece is a dangerous country for my health, though. I love sweet things, especially the kinds of syrupy pastries, such as baclava, which are common down there. There’s this big corn cob sized thing that’s basically very simple dough dipped into caramelized sugar until it has soaked through. I could eat two of those in one go, which makes the locals look me a bit weirdly. Gyros is something we need to import to Finland, and good riddance for our kebab joints after that. Also, almost all the dinners we had included something like 8-9 different dishes. A-yup, I again managed to gain three kilos in nine days. Noms and lulz were had. Batteries: recharged, off to new challenges! And it was a great pleasure to have you lot here! Interesting article. 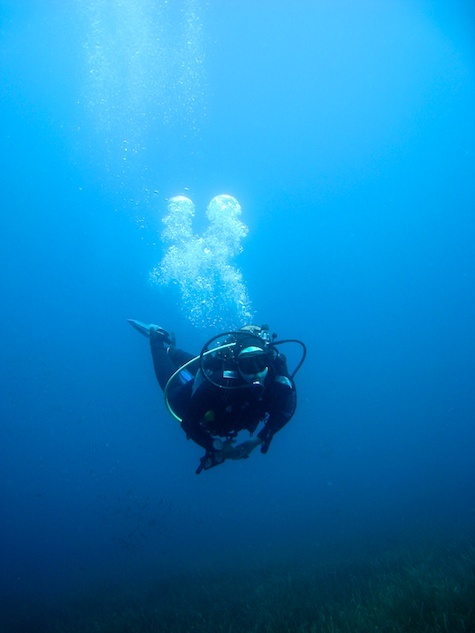 I usually search new dive sites on https://dive.site. Not only that I can explore and add new dive sites, I can also use it as an online logbook in order to keep track of my dives. I’ve been looking for a service like this for a long time, but the ones I’ve found before this one are slow and their interface is not as nice.